Dream Theater releases its ninth studio album, Systematic Chaos, this June, and embarks on yet another world tour. 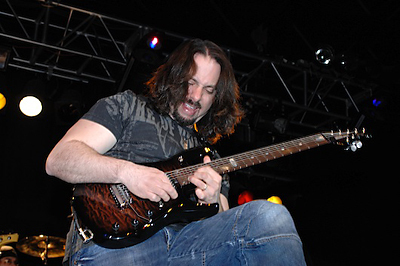 Once again, John Petrucci’s explosive, articulate, and dynamic playing will either inspire you to new musical heights or make you give up trying to play the instrument altogether as you contemplate the pointlessness in trying to reach his level of mastery. Of course, since you’re a MusicPlayers.com reader, naturally you’re in the camp that draws great inspiration from progressive metal’s most accomplished guitarist. One week after catching John perform an outstanding instrumental set with Dream Theater band mate Mike Portnoy and bassist Dave LaRue on the final evening of the G3 tour, we met up with him at the band’s rehearsal studio in Manhattan during preparation for the upcoming tour. 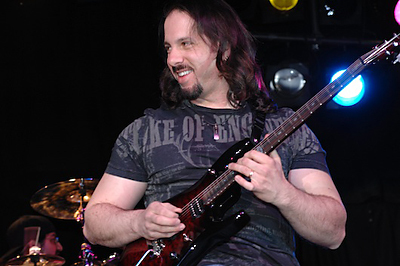 Always happy to talk about music, a very amiable and humble John Petrucci sat down with us for an hour to talk about the new record, some new instruments, and more. My concept is that I always do what’s right for the song. MPc: The band went in a very heavy direction on Systematic Chaos. Tracks like “Constant Motion” and “The Dark Eternal Night” are among the heaviest songs we’ve heard since your album, Train of Thought, and they really come across as more speed metal or death metal than progressive rock. Tell us a bit about the new album. 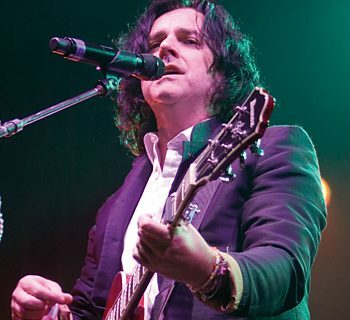 JP: Well, just commenting on those particular songs… Ever since I busted out the seven-string guitar we seem to have written songs that are in that heavy zone. What I wanted to do with the song “The Dark Eternal Night” was just have a classic heavy riff. There are certain identifiable riffs when you’re playing in concert where you start the riff and people just kinda’ go nuts. So that song is probably just about as heavy as any song we’ve done, like “Glass Prison.” I think the thing that makes it come across as being heavier is probably the vocal approach, that it’s a bit more growly in the vocal department. MPc: I wonder if you guys wrestled with the decision in mixing this record to distort James’ vocals. When you’ve got a singer with a pristine vocal quality you have to think twice about that technique. MPc: He’s not an angry sounding guy. JP: No, [he doesn’t have] an angry sounding voice, so that’s why we had Mike double it. Mike does that great, and then the two together made this kind of monster sound. So it took some work to get there. MPc: What about the rest of the album in general? JP: We were really excited about it. We started writing this record after being off for about five months after the Radio City Music Hall show [captured spectacularly on the Score concert DVD]. We reconvened right on the same day the kids went back to school. It was September Fifth that we went back to the studio. We recorded here in New York at Avatar Studios. We set up all our gear in a circle like we’ve done before. We worked with [engineer] Paul Northfield for the first time, who turned out to be just a fantastic guy. He engineered the record, he was there when we were writing it, he ended up mixing it, he mixed the 5.1 version, and he just became like a sixth member – just a really great guy. MPc: If I had to point a new listener to just one song and say, “Here’s what Dream Theater is all about” – it really captures all the elements that define Dream Theater music. JP: Yeah, it really does, because it’s thematic. It has a combination of chops and stuff, but also very melodic themes, and I just think it’s a good representation as well. The clean thing – yeah, that’s the F-1. 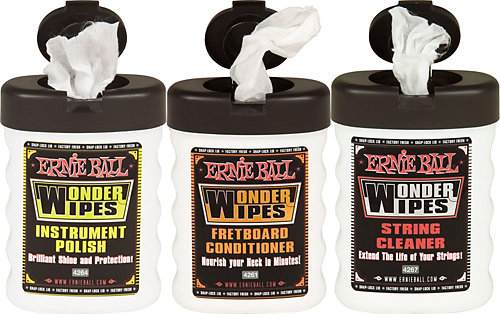 It’s the Ernie Ball [Music Man] F-1 through a Mesa/Boogie Lone Star and a TC Electronic 2290 that’s doing the delay. [Playing on] the G3 is one of the most enjoyable things a guitar player could ever do. MPc: I never would’ve thought it possible, but it seems you’re actually soloing faster on Systematic Chaos then before. Did you consciously note that you were playing faster melodic lines than usual? JP: My concept is that I always do what’s right for the song. That’s how I approach it, so if something calls for something to be blazing and that’s the way I’m hearing it, then I’ll push myself to do it that way, but I don’t go in ahead of time and say “I’m gonna’ play faster than I ever did” – I just do what’s right. If I’m in the moment… you know the solo in “Constant Motion” – the very end of it, the way it climaxes, I thought, “I gotta’ go further, take that very end thing far,” so I remember pushing myself to do that, but it’s not a preconceived notion. It’s just whatever works for the song. MPc: If you were to pick your favorite technical exercise for warming up, what might that be? JP: Oh man, it’s hard to say (laughing). Because there are so many of them that I do, I don’t know if I have a particular favorite. But probably something that I do very often is some sort of variation of playing through linear fragments like different scale sequences, because when you work on those little things, it makes you able (eventually) to connect the big picture. 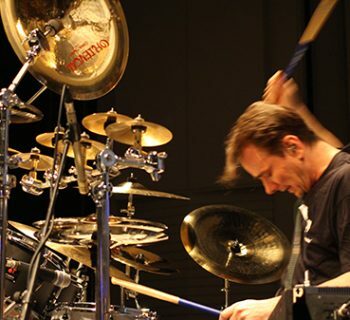 MPc: I remember reading in an interview, or in the extras on one of the Dream Theater DVDs, that you spend time warming up before shows playing through some of your difficult passages slowly. JP: Absolutely. I still do that, and it has a dual purpose: One of them is that it gets you comfortable as far as your memory goes, so when you go through it slow, you know when you walk on the stage you know what you’re gonna’ play. It helps you with your confidence because there’s nothing like getting up there and being like, “Oh! I don’t know this!” So it helps with that, and then it also helps with just developing your technique because you’re practicing what you need to play specifically. And my solos, the way that they end up being, they’re always a combination of techniques, so they make for great exercises. MPc: Most of the solos you perform live with Dream Theater tend to be true to the recording, and those are complex, worked-out parts. Tell us about your experience on the G3 tour where every night you finish with a live, improvisational jam at the end. JP: It’s so different. 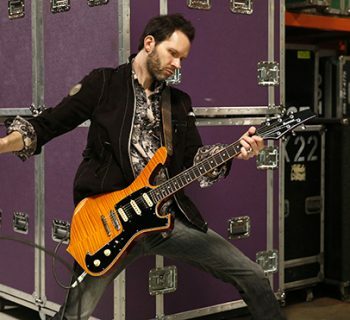 First of all, the G3 is one of the most enjoyable things a guitar player could ever do for a couple reasons: One, you’re playing with Joe Satriani, and in this last one, Paul Gilbert. Last year, towards the end of the year, was with Eric Johnson and Steve Vai. So you’re playing with these great guitar players every night. It’s instrumental, so you don’t have as many of the confines of playing in a band with vocals and keyboards and all of the production that is associated with that. It’s a little looser, there’s more improvisation, so I’m just smiling the whole time. It’s a blast. JP: (laughing) Actually, all the ones I played were the F-1s on the tour – I don’t have the Twentieth Anniversary one – which one is that exactly? MPc: Cosmetically they added a commemorative plate at the twelfth fret, and they made a few special finishes available. JP: I actually don’t have any of those, but speaking of Music Man, they are the most wonderfully company. They really are unbelievable. For this [Dream Theater] tour that’s about to start, they made me, I think, twelve F-1s, and they’re all beautiful – every single one of them are gorgeous. Basically, I have a bunch of different tunings that I use: seven string in standard, drop D, tune down to D, tune down to E flat, tune down to C... I have an “A” rig and a “B” rig – and I have a back up for the six’es, so there’s like fourteen or so. They give me amazing support. And the quality is there in every single one of them. They’re gorgeous, beautiful, they sound great, and play great. MPc: Switching our focus to songwriting, tell use about the process of writing a Dream Theater song. How do you go about creating a song like “In The Presence of Enemies?” Where does it start? Do you build on a theme, or a groove, or a chord progression? JP: It’s a little bit of all of that. It really just stems from us jamming. We get together and we start playing and improvising, and as we’re doing that, sitting there for a half hour just improvising, we sort of stumble onto ideas, and those ideas are further developed. The song begins to get arranged, but a lot of it stems from improvising together because when you jam like that and everyone’s listening intently, things just start to come out. Sometimes things are more deliberate. Like I said, on “Dark Eternal Night” I wanted to write a riff in the kind of Mudvayne style, so I deliberately did that. Once we sort of zone in on ideas, like, “Oh, that’s a great progression,” we’ll write it down. We’ll call that progression something like “D Theme” or whatever, and we make lists and so on. We have a big board [that we make notes on], we develop a library of ideas, and then we start arranging the songs and picking from those ideas and say, “Oh you know what would be great there? That theme we played before D. Can you play that again?” And then we might say, “Well you know what would sound really cool out of that is some unison thing,” and then we’ll have to write that. We just talk it out and build it. MPc: At what point in the process does James get involved with lyrics or vocals? JP: He’s there the whole time, kind of sitting there and listening to what’s going on, which is nice. In the past, he hasn’t always been there. We’ve written everything and just brought it to him before, but the last couple of albums he’s been there during the whole process, which I think is great because his head is wrapped around what we’re doing. He knows which sections are vocal sections, and it’s not far into the process that he’s hearing it for the first time. But then his actual involvement really comes when he starts singing his tracks, which is usually at the end. 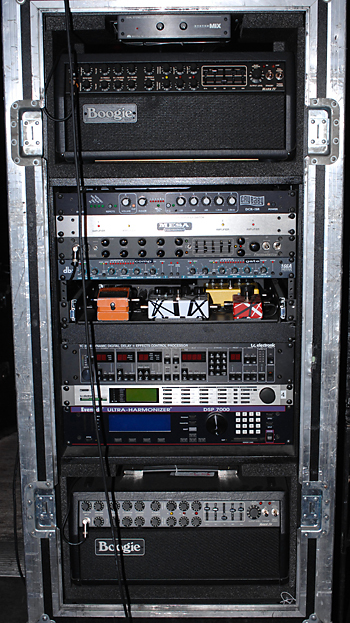 John's rig from the G3 Tour, which is basically his "B" rig on the Systematic Chaos tour. The "A" rig includes a Mesa/Boogie Lone Star for clean tones, and presumably a few other goodies that we haven't seen yet. MPc: You and Mike have produced many of the Dream Theater albums over the years. Did you make any particular changes in your approach to recording your guitar on the new record? JP: I didn’t change my approach to doing it, but I changed the gear that I used. Obviously it’s a new guitar with different wood, so that’s a big change right there. I’m still using Boogie, of course, but I’m using a different amp. I used a Mark 4 for this record. MPc: Was this the rig that you had on the G3 tour? MPc: My first surprise at G3 was no Road King amps, so I guess we can transition now into talking about the gear on the new record and what you’re going to go on tour with. JP: We used the Road Kings starting with Train of Thought, I guess, and I still love that amp. Obviously it’s a Rectifier sound. I had been using Mark series amps for a long time – the Mark 2-C Plus and Mark 4s, and I wanted a change. I was doing a lot of detunes and I wanted to do something that was more of a saturated sound, maybe not so classic sounding. That’s why I switched to the Road King. It’s something that had a ton of gain. I did that for a few albums and a few tours and then I was ready to make a change, which I usually do. And I fell in love with the Mark 4. I have a bunch of classic C Pluses, and I fired those up and they sounded great, and then I fired up the Mark 4 right next to it and I was like, “Wow. This sounds amazing!” and like I said, I fell in love with it. Maybe it’s the combination of the new guitar with that amp – it sounds amazing, so I ended up using that on the whole album. I used it all through the three G3 tours I did, and I’ll be using it on the world tour as well. MPc: Is your new touring rig different from the one I saw and heard on the G3 tour? 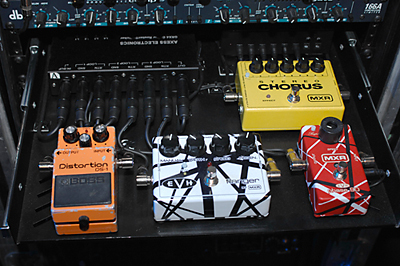 JP: Well this rig here [looking at the rig photo] is what I used on the G3 tour, and it will end up being our “B” rig. We have an “A” rig and a “B” rig that kind of piggyback. If we have a gig that we can’t really get to realistically by trucking stuff, we’ll fly some stuff over there in advance. The “B” rig is smaller, too, so that’s what that is. The “A” rig has more gear, but it’s very similar. The BOSS DS-1 was a gift from Joe Satriani on the G3 tour. MPc: You also have the Boogie Lone Star now. JP: The Lone Star is in the “A” rig. I have a little bit more room so I can fit it in there. In this rig [the G3 touring rig], for the cleans I have a Mesa/Boogie Formula preamp, which is good. MPc: I was wondering what the Formula was doing in there! JP: Yeah, that’s my clean sound. The Mark 4s have great cleans, too, so I also have that as an option. MPc: Last spring you mentioned to us that you were going to be spending some time over the summer working on another instructional video. Any update? JP: (laughing) I lied! I spent the summer swimming! Yeah, the two most asked questions I hear lately are when am I gonna’ do another instructional video and another solo album, so I guess I have my work cut out. You know, it’s funny. I have to really be inspired to do that [instructional] stuff, and we have a whole world tour that we’re embarking on. What I would like to do is have some kind of mobile recording thing or laptop setup so that I can get some ideas going – there’s plenty of time when you’re traveling to work on that. Keeping a complex rig under control is easy with the Axess Electronics FX1 MIDI foot controller. MPc: Now for a MusicPlayers.com readers’ favorite – first thought retrospectives. I’ll run through the list of your studio albums and I’d like for you to tell us the first story or thought that comes to your mind related to you and guitars for that record. Let’s start with When Dream And Day Unite. JP: Well the first thing that comes to mind is that I didn’t really have any equipment! I didn’t have any gear. I had my B.C. Rich guitar and I don’t even remember what amp I had. I had never recorded before, and that’s when the engineer at the time turned me on to Ibanez. We recorded in Pennsylvania near the Ibanez factory. It was right down the road and they sent me all these Ibanez guitars, and so that’s when that relationship started. JP: Images and Words was produced by David Prater, and he had very specific ideas on recording guitar. Once again I didn’t have a lot of experience, so I came in with my guitar… that’s when I got the first Picasso guitar [Ibanez JPM-100]. I remember being at the studio and Ibanez telling me, “Oh, we’ve got this crazy paint job. Does it matter to you?” and I’m like, “Well as long as the wood and the pickups are good I don’t care what it looks like,” and I remember opening up the case and thinking, “Hey, that’s pretty cool!” and I stuck with that guitar. 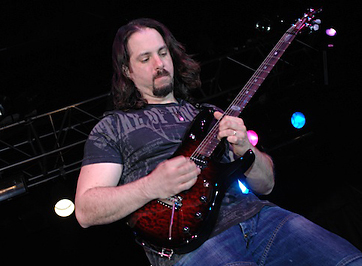 JP: Awake, guitar-wise, was the first introduction of the seven-string guitar, and also a Rectifier. Before that, I wasn’t really using one, and this was also after having touring experience, so now I started to know more about gear. We had done the whole Images and Words tour, so I knew that I liked Mesa/Boogie. I’d always played Boogie, but I knew which ones I liked. I had a Triaxis at the same time as a Rectifier and a C Plus, so I was taking the touring experience into recording, which differed from the first two albums because I didn’t have any experience then. JP: Something that pops into mind is the solo in “Change of Seasons” – it was improvised. It was a scratch solo. JP: Yeah. I didn’t like it, and it was David Prater again. He came back and he was like, “That’s the solo. That’s awesome!” and I was like, “That sucked! I just improvised that!” and I remember trying to redo it, and he was getting impatient with me and he [insisted that first take was the one]. We left it, and to this day, I’m not crazy about it. JP: Falling Into Infinity was done at Avatar, just like Systematic Chaos. Kevin Shirley recorded that record, produced it, an engineered it, and one of the things I totally remember is that we had all of this Boogie stuff in one room. We actually made a poster out of it. I borrowed cabinets – they sent me cabinets. My goal was to pick the perfect cabinet. I had 4 x12s with ninety-watt speakers, and halfbacks, and all these different things. That’s when I discovered and fell in love with the 4 x 12 Rectifier Traditional cabinet, which is what I’ve used ever since. MPc: Do you use it with the Celestion Vintage 30s? JP: Vintage 30s, but on Falling into Infinity we experimented with everything, like the twenty-five watt greenback speakers. I had every Boogie head you could imagine in this room. It was like a guitar store – it was awesome, and we centered on that cabinet and I’ve used that cabinet ever since. I think it sounds really natural, just the way it resonates and everything. MPc: Scenes From a Memory. JP: Scenes was the first record with Jordan [Rudess, keyboards]. Guitar-wise, that was mostly Mark II-C Plus on that one. I love the guitar sound on that album. I really do, and the funny thing really has nothing to do with guitar, but it was originally mixed by David Botrill [Tool, Godsmack, Staind…] and I didn’t like it, so Kevin Shirley stepped in at the last minute. I was like, “Kevin, you’ve gotta’ save me,” and he remixed almost all of the songs – I think maybe two weren’t, and I remember he just did it so fast and it sounded great to me. MPc: Six Degrees of Inner Turbulence. JP: Train of Thought was a record we wrote instead of writing in the studio, like with Scenes and Six Degrees, we actually wrote in a rehearsal studio in Manhattan and demo’d the stuff, then went to the studio and recorded it. It was the first album we recorded on Long Island. I live on Long Island. All of this time we never recorded on Long Island! So it was great for me – it was awesome (laughing). That’s when I busted out the Road King. And it’s also guitar-wise the first time where I did all the drop tunings. I had songs in standard, songs in E flat, songs in D, like “Endless Sacrifice” and then “In the Name of God” and “As I Am,” and “Honor Thy Father” in C, so that’s when I started the nightmare of needing more guitars. And that whole time I was experimenting with string gauges. I remember that was a big deal for me. MPc: What are you using? JP: I simplified it since then. I use nines on my standard guitar and on my drop D, nines on an E flat, and then when it goes to D I just use tens, and when it goes to C I just use elevens, but I remember on Train of Thought I was combining string gauges and trying to come up with the perfect thing. It was a lot of experimenting to do that. JP: Octavarium was done at the Hit Factory, which closed – we were the last band to record there. It was the first album recorded with an orchestra, which was fun. Octavarium was also mostly Road King, but I reintroduced the Mark 4 and [added] the Lone Star on that record as well. That album also marked the beginning of me using the [DiMarzio] D Sonic pickup because after doing records and touring, I was looking for a little bit more thickness on the higher notes and Steve Blucher at DiMarzio was like, “Oh, you know [Brad Delson] from Linkin Park has a signature pickup and I think you might really like it. I really love this pickup.” So he put it in one of my guitars [replacing the DiMarzio Steve’s Special bridge pickup] and we A-B’ed it and ended up recording the record with that.